Hard as it is to pick one scene that captures everything that is so delightful about the endlessly entertaining The Muppets, let me go with this one: During the climactic live Muppet Show revival at the end, Camilla—beloved chicken of Gonzo the Great—and several poultry friends perform a version of a certain recent, ubiquitous Cee Lo Green hit. The tune is sung entirely in “buck buck” noises, without subtitles—not just for a moment to establish the gag, but in full chorus-verse-chorus. And the longer it goes, the funnier it gets. Maybe you have to love everything the Muppets were in their late-’70s heyday to appreciate why that’s a quintessentially Muppet-tastic moment. First, it’s musical, capturing the let-us-entertain-you variety vibe that carried The Muppet Show and The Muppet Movie. Second, it’s equal parts silly and subversive; just try not to walk out of the theater without thinking of the song’s title as “Cluck You.” Co-writer/star Jason Segel has proclaimed loud and long to the media of his abiding affection for the characters, but The Muppets is the proof. He not only “gets” them, but he knows how to re-capture what made them great. Segel and writing partner Nicholas Stoller find their surrogate in Walter (performed by Peter Linz), the Muppets’ biggest fan—and also, though he seems completely unaware of it, a Muppet himself. When he and his devoted brother, Gary (Segel), take a trip to California with Gary’s longtime girlfriend, Mary (Amy Adams), they learn that ruthless developer Tex Richman (Chris Cooper) is planning to tear down the old Muppet Theater to drill for oil. Scant days remain to raise $10 million to save the place, which means it’s time to find a now-retired Kermit (Steve Whitmire) and try to reunite the fuzzy crew for a benefit telethon variety show. The resulting plot is a mix of the road-trip flavor of the first Muppet Movie, Andy Hardy “let’s put on a show” musicals and the “we’re putting the band back together” premise of The Blues Brothers, complete with finding Gonzo now a wealthy plumbing entrepreneur who may not want to give up his swank gig. It’s a set-up that allows for plenty of free-flowing humor, and the kind of trademark meta-awareness that allows characters to share exposition that “sounds like it’s going to be an important plot point later on,” or save time by gathering the rest of the Muppets “in a montage.” For 97 minutes, The Muppets sends out wave after wave of puns, broad visual gags, self-referential asides and genuine warmth—and nearly every last bit of it works. It might work best of all in the musical numbers, which are inspired both as catchy songwriting and as showcases for brilliant humor. The opening production number on the Main Street of Smalltown combines sheer unapologetic exuberance with absurdist verses and a great visual punch line; Tex Richman gets a classic villain song in rap form, complete with follow-the-bouncing-ball onscreen lyrics. And then there’s the dramatic “Man or Muppet,” in which Gary and Walter contemplate their respective life paths while duet-ing with their alter-egos—Walter’s in the human form of one of many guest cameos, Gary’s in a Muppet form that looks disturbingly like Mitt Romney. Director James Bobin has plenty of experience working with humor-filled tunes from his work on Flight of the Conchords, and he finds just the right pitch for every tune. When you’re dealing with something like The Muppets, it’s hard not to ponder how much nostalgia plays into one’s response. But there’s the nostalgia that comes from simply trotting out a bunch of characters and saying, “Hey, remember them?,” and then there’s showing such a deep respect for your source material that you allow another generation to fall in love with them for the exact same reason the previous generation did. Perhaps that’s why it’s not a big problem to hear Eric Jacobsen perform Fozzie Bear and Miss Piggy in a slightly shriller register than Frank Oz—because hearing the familiar voice isn’t the whole point. As Kermit suggests near the end of The Muppets, maybe you don’t need to have everybody love you, as long as one person does. 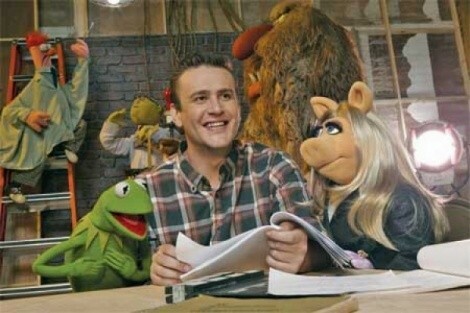 Jason Segel loved the Muppets enough to give them a showcase that’s a clucking masterpiece.